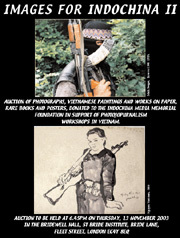 Auction of photographs, vietnamese paintings and works on paper, rare books and posters, donated to the Indochina Memorial Foundation in support of photojournalism workshops in vietnam. Photographs which were printed and used for the editing and production of the book "Requiem by the Photographers who Died in Vietnam and Indochina" (Horst Faas & Tim Page, Random House, 1997) Lots 1-72 (most lots contain multiple images). Prints made from original radio-photo negatives of images broadcasted by the AP in the war years 1970 - 1971. The negatives are from the collection of a retired news agency photo editor who worked in Lima, Peru. Radio photo transmissions provided yesterdays Viet Nam War pictures for today's newspapers in these years. Lots 73-83 (all lots contain multiple images). Photographs taken by Henri Huet of The Associated Press, 1965 - 1971. He died when his helicopter was shot down. The photos were selected and printed for a book project of his work, which could not be realised until now. Lots 200 - 231 (most lots contain multiple images). Historical photographs and etchings from Indochina (dated from 1885 - 1954) from the Collection Reger-Viollet, Paris. Lots 232 - 250 (most lots contain multiple images). Photographs and reportage taken by contemporary Vietnamese photojournalists, most of which had participated in the 2002 IMMF Photojournalism workshop in Ho Chi Minh City. Lots 342 - 366 (all lots contain multiple images). can be found in the end of the catalogue.